For generations the Gideons in Canada have presented each student in grade seven with a New Testament including pages of helpful notes. Thousands of anecdotes and stories attest to how God has used this portion of the Bible to bring young people to Himself. Recently, however, many school boards have forbidden the Gideons from distributing these New Testaments to schoolchildren. Satan, mankind’s greatest enemy, hates God and His Word, actively fighting every attempt to distribute Bibles. I can personally attest Satan tries everything in his power to keep the Bible from being translated into the remaining 1,800 languages that still do not have any part of God’s Word translated into them. No doubt he laughed a long, loud infernal laugh when the school boards slammed the doors shut in the Gideons’ faces. He didn’t know it, but he laughed too soon. In motivating those boards to stop young people from receiving the New Testament, Satan shot himself in the foot. The Gideons International in Canada developed a smart phone app with an up-to-date New Living Translation of, not just the New Testament, but the full Bible. This app called NewLife not only has the Bible and the original helps that came with the Gideon New Testament, but with a greatly expanded set of hyperlinked helps, explanations, introductions and readings. 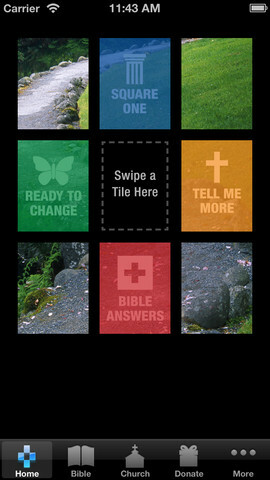 With this easy-to-use app readers of any age can start at SQUARE ONE and explore topics like “God’s existence,” “the purpose of life,” “what’s truth,” “morality,” “the Bible,” and “Christianity.” Or they can go straight to the TELL ME MORE section where they’ll explore topics like Jesus Christ, faith, sin, prayer, church and so on. Throughout the app they’ll find suggested readings for when they want to dig deeper on a particular topic. Clicking on each book title will take them to a quick synopsis of the book. Also featured in NewLife is a BIBLE HELPS topical index section with common things people want to find in the Bible. For example, you can find Bible verses for when you’re afraid, or considering marriage, needing peace, or feeling victimized. You can also find important passages like the Christmas and Easter stories, some of the miracles of Jesus, or a selection of the most popular Psalms. Wondering what the foundational Christian virtues are? Scan the list and read the Bible verses that apply, on their own or in context. What’s Easier than Flipping Pages? Touching A Screen. When you’re READY TO CHANGE, the app will walk you through the steps you’ll need to take to start a new life based on the teachings of Christ. By the way, the app was put on the Gideons in Canada website just before Christmas without any fanfare, promotion or advertising. Within days, positive comments came from all over the English speaking world including two people in the UK who indicated they had repented and accepted Christ’s forgiveness for the first time in their lives when they followed the steps in this section of the app! Currently NewLife is available for use only on iPhones, iPods and iPads. When an Android version of the app is developed, the users of half a billion Android phones and other devices will be able to download the NewLife app too. By then, a new feature will help users find churches nearby. When Satan closes one door, God opens another. And what a door! Doesn’t this situation remind you of that text in 1 Corinthians 2:8? “The experts of our day haven’t a clue about what this eternal plan is. If they had, they wouldn’t have killed the Master of the God-designed life on a cross” (MSG). In the same way, if Satan had known God’s plan to mightily expand the availability of His Word to school children and millions of others, he wouldn’t have pushed those school boards to forbid the distribution of New Testaments in schools. Yes, this time Satan shot himself in the foot. No doubt he’s enraged at the way God turned his evil plans into a good outcome. Can you imagine Satan hopping mad on only one foot? 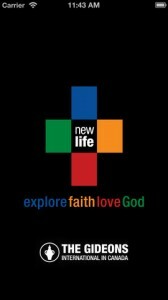 Those of you who use Apple mobile devices, go to www.gideons.ca and click on the iPhone App tab which will take you to the iTunes store to download NewLife for free. With this app any Christian, even a grade seven student, can sit down with a friend and answer his questions, even lead him to faith in Christ. It’s all there, so easy to follow, so easy to share. Doesn’t this make you want to break out and sing Our God Reigns!? Remember the column I posted last January titled How to Get What You Want in 10 Minutes a Day? In the weeks that followed, many of you wrote to tell me you had started your Ten Things I Want list and since then some of you have told me of your progress. My starter list had 10 items in three main areas, Relationships, Health, and Ministry. A few weeks later, I added Lifestyle as another area and combined several items to keep within the limit of ten. In March I copied the latest List of Ten from my spiral notebook to my word processor and greatly expanded each item with many more details. By then I had already gotten two things I really wanted and was making good progress towards getting some others. I cut back from copying daily to three times a week. 1) Relationships: Prayer life, I wrote my requests, and God’s answers in a prayer diary averaging four times a week, my goal was five times a week. Regular Bible reading, in depth conversation and prayer with Jo about six times a week. Strengthened relationships within our family by being available to help in practical ways. 2) Health: Jo and I started a personal make over and are now in better physical shape than we have been in many years. We really don’t want to regress! 3) Lifestyle/Financial: We downsized some more, giving away a lot of stuff we “might use someday” but still have a long ways to go. We have a clear picture of our overall financial state: (income, expenses, and trends for the future.) We have researched about living in a better climate elsewhere in Canada and are more aware of our fiscal limits. 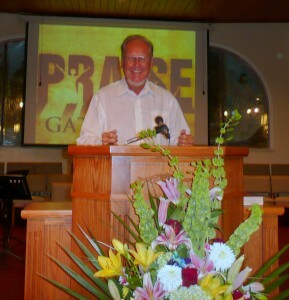 4) Ministry/Legacy: Although I accepted every invitation to speak or teach, (37 in North America, and 11 overseas) there were 20% fewer events than the average. Reached my goal of writing and publishing about 60 articles for my personal blog and other blogs and magazines. Edited and published my first ebook, A Tickle in the Funny Bone and made a good start towards publishing a larger ebook this year. Some of the things I really wanted at this time last year in the Relationships and Health areas seem to have become an ingrained daily habit, which means I can focus on other things I really want this year in the area of personal education—some things I really would like to learn and practice. So, what about you? Did you make a list last year? Did you copy it every day? How long did you have to do this before you saw some results? Are you going to make a new list of Ten Things I Want this year? Here’s the How To: How to Get What You Want in 10 Minutes a Day?